I don't know about your kids, but my daughter loves her Shopkins! 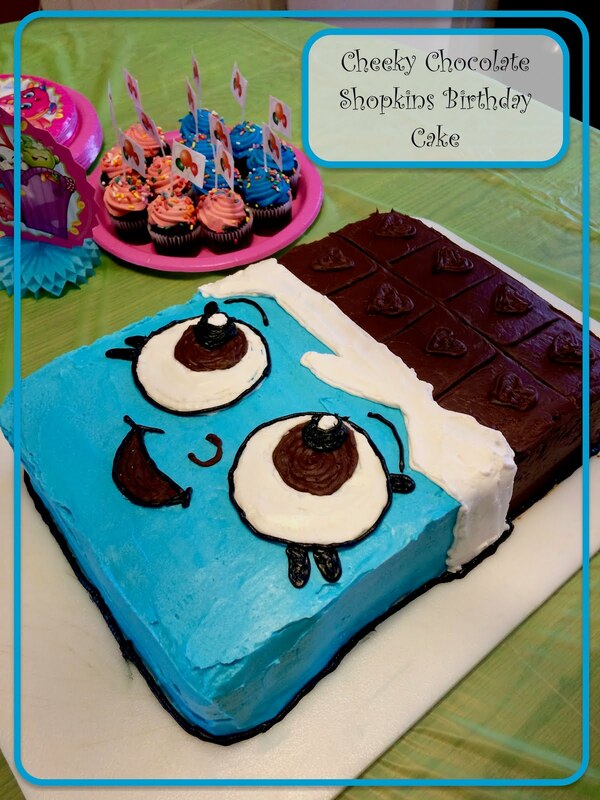 She attended a birthday party at a friend's house earlier in the year with a Shopkins theme and when it came time for her birthday, she just had to have the same! I was happy to oblige. My kids were a little late to the Shopkins game, but they've been collecting them for a while now. I have to admit, the little figurines are quite cute. When they first started collecting them it was sometimes difficult to find them in stock. But now, after a year or so my kids have friends giving them their old ones. Works for me! Back to the party planning! Once we had a theme we had to decide on a cake. It had to reasonably meet my daughter's expectations and be within my skill set. My daughter and I searched the internet for a while, trying to come up with a good idea. We saw some simple cakes using the actual toys as decoration. Not a bad idea. My daughter wasn't interested in that style. There were other elaborate cakes with so much detail I was not willing to even try. Then one night while I was saying goodnight to my daughter, we looked at her Shopkins poster and saw Cheeky Chocolate. "What about that one?" I asked her. She liked it! The rest is history. There are some errors in the design, but overall I think it turned out cute and resembles Cheeky Chocolate quite nicely. Follow the instructions on your box cake mix and pour each cake into a 9x13 pan. While the cake is cooking, mix up a batch of the Best Buttercream Icing. Put 1/3 of the mixed frosting aside in a bowl and leave it white. Cover. Place 1/3 in another bowl, put aside and cover. Leave last third of frosting in the mixer and very slowly add sky blue until you reach your desired color. Cover and put aside. To one of your bowls of white frosting, add a few tablespoons of cocoa. You may need to add a small amount of cream to fix the consistency. DO NOT mix in any black food coloring yet. Add brown food color if necessary to get desired color. Cover. Once the cake has cooled, check if it is even. If not, trim as needed. Place one cake on desired tray then top lightly with white frosting. Place the second cake on top of the frosting. No frosting should be oozing out the edges. Next, you will use the chocolate brown frosting to make the exposed chocolate bar. Spread the frosting smoothly over the top of the cake where the chocolate bar should be. Wipe off the frosting knife and gently drag it sideways to make 8 chocolate squares. Then add some chocolate frosting to a piping bag fitted with a writing tip. Make small hearts in each chocolate square. TIP: To make your frosting smooth, dip a clean frosting spreader in warm water, remove from water and shake off excess. Use knife to smooth frosting before it hardens. Now you will take your blue frosting and spread it over the remainder of the cake. After the blue is spread smoothly, take some of your white frosting and add it to a clean piping bag equipped with a writing tip. Outline a white wrapper (look at picture for shape) bordering the brown and blue. Then take your spreader or a smaller knife and fill the outline with white frosting. Once the wrapper is complete, find a round template such as a glass and make a light mark where the eyes should go. Outline the circle in white and fill in with white frosting. Do the same for the inner brown part of the eye, using a smaller circle template. The nose and inside of the mouth are also brown. Now you will make your black frosting. Take your chocolate frosting and mix in black food coloring until you achieve your desired color. You will not get a good black without using chocolate frosting. 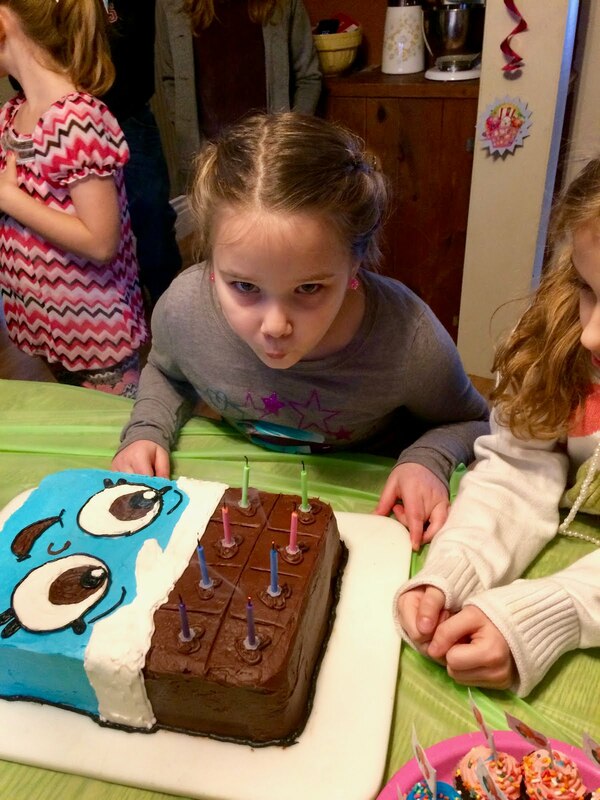 The amount of food coloring you would need would leave you with a very bitter frosting. Add the frosting to a clean piping bag equipped with a writing tip and add the last details you see in the picture above. There you have it! Cheeky Chocolate. 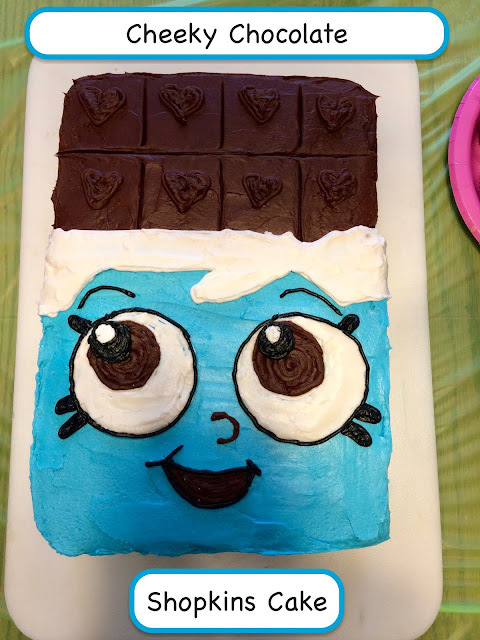 I hope you enjoyed seeing this cute cake! Let me know in the comments below if you've ever made a Shopkins cake or if you try this one out. I am going to remember this for my daughter birthday in December! Awesome! Great! Thanks, Claire! I'm glad you like it. If you take it step-by-step it's not hard at all!